Welcome to our first edition of “A Cut Above,” Minnetonka Glass & Mirror’s monthly blog. We are pleased you found your way here and we look forward to sharing valuable and noteworthy tips, tricks, trends and recently completed projects. This month our topic is Shower Doors 101. The elementary, entry level basics of what you need to consider when selecting a new shower door. So, it’s time to spruce up your old bathroom! This can be a very exciting decision, but the task of where to begin can feel daunting and overwhelming. Well, have no fear! We’re here to help every step of the way, especially when it comes to selecting your brand-new shower door. Size, shape and location make a difference! It’s important to consider the floor plan of your bathroom when selecting your shower door. Everything from where the opening to your shower is going to be, to what obstacles may be in the way, all the way to the type of shower door you desire, and even the shape of your shower hinge [pun intended] on the floor plan. Here are some important questions to consider: Is there enough clearance for your shower door to open outward? Does the vanity need to be moved over three inches? Or is a sliding shower door going to be your only option? Once your bathroom floor plan is determined, you will be able to move on to deciding what type of shower door is going to best fit your bathroom, both esthetically and functionally. The experts at Minnetonka Glass & Mirror will be happy to help assist you with selecting the best shower door for your application. They personally walk you through the pros and cons of each viable shower door option, so you can make the best decision based on your needs. Next up on the decision-making list is determining what type of glass you would like for your shower door. Many people love the clean look of clear glass for their shower door, while others like the privacy etched, decorative or art glass offers. Last, but not least is selecting your shower door hardware. This is the icing on the cake that can tie your entire bathroom together. If you have never gone through this process, you would likely never guess that hardware goes far beyond the shower door handle. Hinges, headers, pulls, knobs, towel bars, towel hooks, and more are included too! Minnetonka Glass & Mirror offers an enormous selection of over 20 different colors and finishes for you to choose from! Keep in mind, it’s important to consider your faucet and fixture finishes when selecting your shower door hardware. Complimenting colors are key. 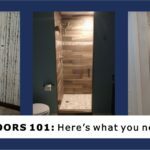 We hope you find this blog post to be helpful in walking you through Shower Doors 101! Please always remember, the professionals at Minnetonka Glass & Mirror are here to help you through these decision-making details. It is most important to us that, in the end, you absolutely love your new shower door and everything that completes your new, beautiful bathroom. We take great pride in supplying you with the highest quality products backed by the best customer service in the industry. Visit us at our showroom!